Sarah is a lead press operator at Gotta Groove Records, a vinyl manufacturing plant in Cleveland, Ohio. Her job is to oversee production by helping a crew run and maintain each of their 7″ presses, handling the influx of various parts for each job, and delegating tasks in order to get as much done as possible each day, etc. When I announced that I was going to be starting this blog, Sarah came highly recommended from several people as someone I needed to talk to. Not only does she have a really cool job but in her free time she’s into bodybuilding / athletic conditioning, things with two wheels, camping / hiking, video games, and cosplay. How did you get into your industry / What motivated you? I was working in the kitchen at a local hot dog joint / bar / venue part time and needed a full time gig, so when a coworker who also worked at Gotta Groove told me they were hiring I sent in my resume. I was told they were in fact NOT hiring, so I just kept bugging the owner every week or so until he finally let me come in for an interview. I had a small record collection so I was pretty stoked to be working with vinyl. I started in the packing department, but when I saw those presses I knew that’s where I really wanted to be. So, I put in my time in the packing department and later moved into the pressing department. What is a day in the life like? I get to the plant around 6 a.m., make some coffee, put my headphones on, and get to work. I start by checking out what new orders have been placed since I last clocked out and I schedule those jobs on the calendar to rough out when they will be pressed and which press they’ll be on. If I have time after that and some other administrative tasks I’ll take the labels that were baked the night before out of the oven (we have to bake out the excess moisture from the ink on the labels, otherwise they will stick to the stampers and make very ugly records) and put them away. By this time it’s about 6:45, and if the mechanic hasn’t arrived yet I’ll go ahead and turn on the transformer, air compressor, and boiler. The boiler takes a little while to heat up, so in the meantime I will put labels on each press, polish the stampers, read the previous night’s notes about how their shift went, look into any issues that need to be repaired right away, get a plan of action for the day together, and get another cup of coffee because it’s about to get busy. At this point it’s about 7 or 7:15 and I’ll be turning on the presses and letting the hot water from the boiler heat up the extruders which are what melts the vinyl so we can make records out of it. My crew starts rolling in around here, so if there’s anything they need to know we will discuss that, otherwise they start checking out the presses to make sure they don’t need repairs and they fire the presses up. Throughout the rest of the day I spend my time making sure things are running well and our scrap is low, troubleshooting issues with the presses and helping with repairs, making changes to the board we schedule each press’s workload on to make sure things are getting out on time and in the most efficient way possible, communicating with our quality assurance department to address any issues they are seeing with the records coming off the presses, and doing any additional tasks the production manager (which is who I report to) needs me to take care of. Our presses are very old and can be very cranky, so they need a lot of attention at times. Some days I’ll have my hands in the press turning wrenches all day, some days they pretty much run themselves. At some point before lunch time UPS drops off a few boxes of stampers (the plates that have a negative of the grooves which we use to press the vinyl into a record) so at that point I check in what we receive, update the list of test presses that need to be done, and head back out to the floor to start covering my crew for their breaks. From there on out we just keep chugging along, making records until second shift gets in and they can take over for the rest of the night. What has been your favorite / the coolest thing you’ve worked on? That’s a tough question! We’ve pressed some records for some bands that I really love, some I can’t talk about because they haven’t been announced by the bands yet but some that I can talk about include Cave In, Drab Majesty, Teen Daze, Tobacco, Sweet Spirit, SURVIVE, Kowloon Walled City, War Brides, Bask, and Russian Circles to name a few. We press so many records it gets hard to remember all the cool ones! Doing the two compilations that Wax Mage Records released was really fun, and of course coming up with crazy colored records and seeing people continue to order them for other jobs is a cool thing also. Another thing I love is pressing records for local bands. It makes me feel all fuzzy inside when they choose to press with us. What has been / is the most difficult part of your job? The most difficult part of my job is probably just getting everything I need to get done taken care of. I wear a lot of hats and it can be dizzying to be pulled in so many different directions. In addition to being lead press operator and having all the responsibilities included with that I’ve been taking on more and more production management related duties, I’ve been training new employees, representing Gotta Groove at events, and some other things. Luckily my crew is amazing and I feel confident leaving them to handle the presses themselves when I have to go take care of something else. What advice do you have for someone wanting to get into pursuing what you’re doing? My advice for someone wanting to pursue a career in vinyl manufacturing would be to get good at problem solving. Making records is fun, but it’s not easy. You have to think on your feet and be ready for whatever happens, whether it’s delayed shipments, errors, mechanical issues, or anything else. Just be ready to roll with the punches and remember that it’s all worth it to deliver that magical experience of buying, opening, and listening to a new vinyl record to the consumer. 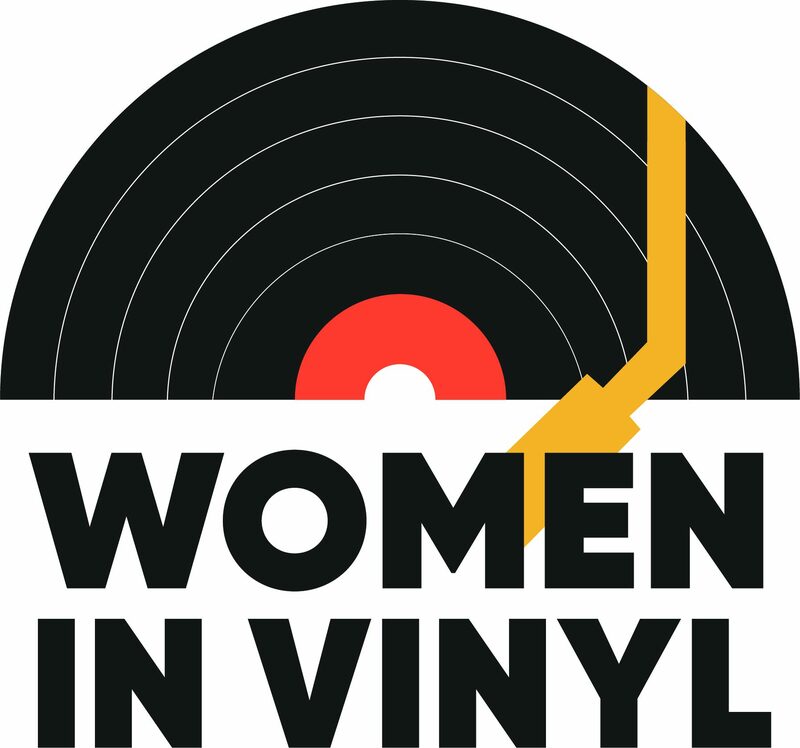 A more pointed tip specifically for women in the vinyl manufacturing industry would be to not be afraid to be assertive, get dirty, and put your ideas out there. Are you a vinyl collector yourself? What drew you to it? I am definitely a vinyl collector. Music has always been very important to me and it is the common thread in almost all of my friendships. Collecting vinyl started out as a shared interest/hobby with my friends. We’d go record shopping together, trade and sell records to each other, and hang out and listen to records. My husband and I had been going to shows and buying records together for many years before we were even dating. Once I started working at Gotta Groove my record collecting kicked into overdrive and now I don’t even have enough shelving for all my records. However, I do have that curse where you walk into a record store and forget everything you wanted to look for, which might actually be a blessing in disguise at this point! What types of things are happening in your industry / with vinyl that you’re excited or worried about? i.e. innovation, or trends you’re seeing. I’m really excited to be seeing so many awesome new vinyl designs coming out, some of them from my own plant / Wax Mage Records. People are really thinking outside of the box when it comes to colored vinyl and I’m all about it. I’ve been listening to a lot of synthwave and noise rock lately. I also always have music I find nostalgic in heavy rotation. Yes! Sarah is an inspiration!